In this Business English course, you will learn how to write a cover letter for a Job Interview. This Job interview tips video is from our Job Interview skills series. For more videos on Job interview question and answers click here. You could also take our Job Interview Training at our Let’s Talk English speaking institute in Mumbai and get success at your dream Job. In this Business English and Job Interview skills lesson, you will learn phrases to write an impressive and effective Cover letter when applying for a job.A cover letter is a document that is sent with your resume to provide an introduction to the employer. Below are the phrases that you can use to create a good first impression. 1. I am writing in response to your advertisement posted on …..
2. I was referred to you by …..
3. Please accept this letter as my application for the position of …..
1. My professional skills appear to be well-suited to your company’s requirements. 2. This position represents an opportunity to continue my committed career path. 2. I am eager to talk to you about the contribution I could make to your firm. 3. I look forward with enthusiasm to an opportunity for a job interview. Hello everyone, I am Niharika and welcome back to a new lesson. Well in today’s lesson, we are gonna look at phrases to write an effective cover letter. Now when do you write a cover letter? When you are applying for a job. And what’s the most important thing that you have to send? It’s your resume. So along with your resume, it’s important for you to send a cover letter as well. So what exactly is a cover letter? Well, a cover letter is, of course, a letter or a document that you send as an introduction to the employer. So kind of adding some additional information about yourself when you are applying for a job. So the first impression counts, am I right? So in this lesson, we will help you with some phrases that would create an effective and very impressive image of yourself in front of the employer. So let’s get started. The first thing that we are gonna look at is starting a cover letter. So how do you begin writing your cover letter? Well of course the first thing is, addressing it. so if you don’t know the person’s name, then you’re just gonna write, hello and followed with one of these phrases here and if you’re know the person’s name then you’re just gonna write, To, Mr. Smith and then followed by one of these expressions. So let’s have a look. The very first one. I’m writing in response to your advertisement posted on so and so website. So probably, you spotted this advertisement either on one of the websites online or probably in the job column of a newspaper. So if you’ve spotted this advertisement then you gonna mention it, okay. So you’re gonna begin writing, I’m writing in response to your advisement posted on, you can name the website’s name, okay. Now another one, I was referred to you by… the person’s name. Okay so you can just mention the person’s name here. now may be your friend mentioned that hey, you know what, there’s a job opening and I think it’s just perfect for you. Why don’t you send them your resume? So, this lady or this friend of yours referred you for this job. So go ahead and mention it, in your cover letter. You’re gonna say, I was referred to you by Mrs. Johnson, okay. Now another one, please accept this letter as my application for the position of… Okay so probably this position of an executive or manager or trainer. So whatever the opening is for like, whatever job opening it is, like maybe it’s for a trainer. So you’re gonna write, please accept this letter as my application for the position of a trainer. Okay, so that’s how you would begin writing your cover letter. If you spotted and advertisement, this is the expression that you’re gonna use. If someone has referred you for this job, then you’re gonna use this and then if it’s just in general, then you can use this, okay. Now, another thing that you need to include in your cover letter is reasoning. So giving a reason that why this job is just perfect for you. So how do you do that? We’ll use one of these two expressions. The first one, this position represents an opportunity to continue my career path. So probably, you are looking forward to a change. Okay, you are looking for a better opportunity and this job opening is just perfect for you. So you are gonna give a reason that you know probably this position represents an opportunity for you to continue your career path, right? So you are looking for the change, you are looking for the jump, then you mention this. Another one, my professional skills appear to be well suited to your company’s requirement. Now usually, when you go online and you’re looking for jobs, you know the company’s requirements are always mentioned and if you think that you are just perfect. You do have the skills, you do have the qualifications and it just perfectly suits the requirements, then mentions this. My professional skills appear to be well suited to your company’s requirements, okay. So this one of the expressions that you can use and now let’s have a look at some expressions that would help you to close your cover letter. So the phrases that you can use to close your cover letter are if you are interested please contact me. So if you think that your skills and your qualifications suit the requirements and you think that they might end up calling you, then just keep it very simple, so if you are interested please contact me and then you can mention your contact details. Now, of course, your resume also has your contact details but if in case, you wanna mention it in your cover letter as well, that is fine. Another one, I’m eager to talk about the contribution I could make to your firm. Now when do you use that? When you’re really excited and you want them to call you for an interview. So mention this. I’m eager to talk about the contribution, I could make to your firm. So it means that you are very positive and you’re looking forward to meeting them in person. The last one, I look forward with enthusiasm to an opportunity for an interview. So this is, like a direct phrase that yes I am sending you my resume and I am really excited and enthusiastic about attending an interview or like a meeting in person. So mention this, I look forward with enthusiasm to an opportunity for an interview. So your cover letter has to be really short. Okay, you cannot end up adding too much of information in it because your resume is a more detailed information. It gives the employer more detailed information. So a cover letter has to be simple, short and sweet. Okay so go ahead, use these phrases that you have learned today. I hope they are helpful to you and do not forget to enclose your resume, right? I’ll be back with a new lesson, till then you take care and good luck for your interview. Also visit our English speaking institute in Mumba and explore our English speaking course. Next Next post: 5 Mistakes that could destroy your career. 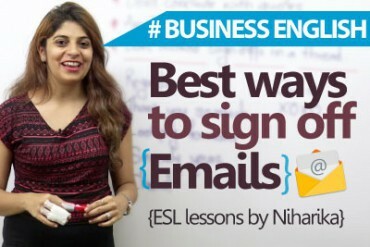 Best ways to sign off an email. 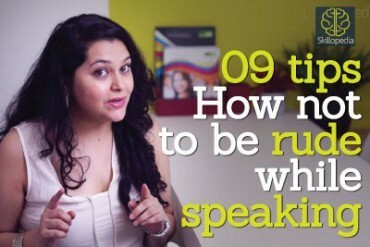 9 tips – How not to be rude while speaking. 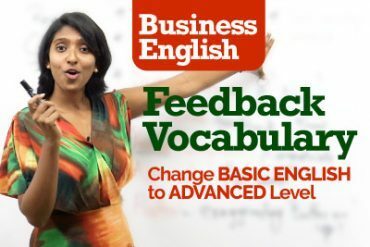 Essential Business English Vocabulary for giving ‘Feedback’ – Change Basic English to Advanced English.